Get fortunate amidst the glorious woods of Sri Lanka where one can enjoy the most bewitching sceneries of this exotic island while exploring the depths of the mesmerizing landscapes. 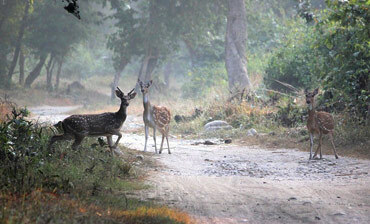 This coastal territory is dotted with amazingly dense woods that can be best discovered by trekking. Day 1: Negombo. A splendid stay at Paradise Beach Hotel for the night. Receive a warm welcome on your arrival. Transfer to hotel while exploring the beach town of Negombo. De-stress yourself and get complete rest by the pool side before starting your trek the next morning. Day 2: Knuckles Mountain Range. A splendid stay at Corbett’s Rest Campsite for the night. Early morning departure from Negombo. Travel into the depths of the Knuckles mountain range post-breakfast. Get settled at the campsite. Commence the 04 hour trek through the lush villages surrounding Sphinx Eyrie. Explore the fluctuating vistas of the Knuckles range while trekking through the emerald trails of the woods. Day 3: Knuckles Mountain Range. A splendid stay at Corbett’s Rest Campsite for the night. Start your trek post-breakfast. Explore the amazing scrub jungle while this 4 hours trekking by foot. Enjoy the whole day trekking on the rough trails in the depths of Knuckle’s range while having some enchanting glimpses of Meemure – the farming village. Take rest at the little village shop for an authentic cup of hot tea, sweetened with “jaggery”, made of coconut sap. Post-tea break explore simple lifestyle the village amidst the spectacular natural setting. You can also de-stress yourself in the cool water of the stream flowing from the mountains of the place. Continue trekking. Walk out from the village valley of Meemure Village. Get back to the campsite for spending the rest of the night in peace. Day 4: Kithulgala. A splendid stay at Rafters Retreat for the night. Transfer to Kitulgala early in the morning post-breakfast. Enjoy the breathtaking experience of trekking in the Kelani Valley Forest Reserve at the afternoon. There are some amazing twists in this trek which includes an exciting crossing of a suspension bridge that stands at the entrance of the forest and the vistas of the dense forest cover along the bank of the Kelani River. You will surely get mesmerized by the rainforest’s splendor of emerald foliage and amazing birdlife. 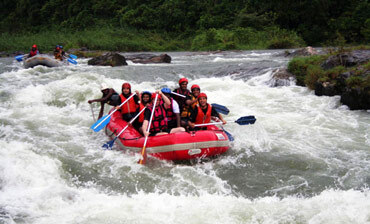 Go on an adventure filled trail along the Kelani River and explore the white waters of the Kelani River with level 03 rafting. Travel to Maskeliya later in the afternoon. Check in at a hotel positioned at the foot of Adam’s Peak. De-stress yourself at the hotel, for the rest of the night post-supper. Travel to explore the enchanting trails of the Adam’s Peak post-breakfast. Day 6: Induruwa. A splendid stay at Royal Beach Resort for the night. Night trek through the trails of Adam's peak, in order to catch the mesmerizing vista of the first sun ray falling over the earth. Once in a lifetime experience of the magnificent sunrise at Adam's peak. Climb down from the peak to relish the breakfast at the hotel. De-stress yourself and proceed to Bentota post-lunch for your beach stay. Day 7 – 8: Induruwa. A splendid stay at Royal Beach Resort for the night. Enjoy some leisure time by the beach side for the rest of the stay or indulge in shopping.